The Restless Universe (Blackie and Son Limited, 1935) - A popularised rendition of the workshop of nature, translated by Winifred Margaret Deans. Born's nephew, Otto Königsberger, whose successful career as an architect in Berlin was brought to an end when the Nazis took over, was temporarily brought to England to illustrate the book. ^ Born, M.; Jordan, P. Zur Quantenmechanik. Zeitschrift für Physik. 1925, 34: 858–888. Bibcode:1925ZPhy...34..858B. doi:10.1007/BF01328531. ^ Born, M. Zur Quantenmechanik der Stoßvorgänge. Zeitschrift für Physik. 1926, 37 (12): 863–867. Bibcode:1926ZPhy...37..863B. doi:10.1007/BF01397477. ^ 4.0 4.1 The Nobel Prize in Physics 1954. The Official Web Site of the Nobel Prize. [10 March 2013]. ^ 6.0 6.1 Nobel prize winner dies. Pittsburgh Post-Gazette ((Pennsylvania, U.S.)). Associated Press. 1970-01-06: 26. ^ Born, G. V. R. The wide-ranging family history of Max Born. Notes and Records of the Royal Society. 2002, 56 (2): 219–262. doi:10.1098/rsnr.2002.0180. ^ Greenspan 2005, pp. 45-49. ^ Born, M. Die Theorie des starren Elektrons in der Kinematik des Relativitätsprinzips. Annalen der Physik. 1909, 335 (11): 1–56. Bibcode:1909AnP...335....1B. doi:10.1002/andp.19093351102. ^ Greenspan 2005, pp. 45–49. ^ 24.0 24.1 Greenspan 2005, pp. 61–62. ^ 27.0 27.1 Kemmer & Schlapp 1971, p. 20. ^ 28.0 28.1 Greenspan 2005, pp. 63–67. ^ 31.0 31.1 Kemmer & Schlapp 1971, p. 21. ^ 38.0 38.1 38.2 38.3 Born, Max. The Statistical Interpretation of Quantum Mechanics — Nobel Lecture (PDF). Official Web Site of the Nobel Prize. 1954 [9 March 2013]. ^ Born，Heisenberg & Jordan 1925, pp. 557–615. ^ 42.0 42.1 Kemmer & Schlapp 1971, p. 35. ^ Born，Born & Einstein 1971, p. 91. ^ 爱因斯坦（著）; 许良英等（编译）. 我深信上帝不是在掷骰子. 爱因斯坦文集 第一卷. 北京: 商务印书馆. 2010: 326. 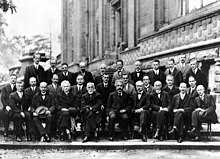 ^ 49.0 49.1 Nobel Prize in Physics 1933. [9 March 2013]. ^ 50.0 50.1 Greenspan 2005, p. 191. ^ Greenspan 2005, pp. 285-286. ^ Max Delbrück – Biography. The Official Web Site of the Nobel Prize. [10 March 2013]. ^ Maria Goeppert-Mayer – Biography. The Official Web Site of the Nobel Prize. [10 March 2013]. ^ Greenspan 2005, pp. 180-184. ^ McMahon, Neil. Mother, model was much more than 'Olivia's older sister'. The Sydney Morning Herald. 25 May 2013 [20 June 2015]. ^ Olivia had long road to stardom. Spokane Daily Chronicle ((Washington, U.S.)). Associated Press. 15 April 1976: 19. ^ 61.0 61.1 Kemmer & Schlapp 1971, p. 22. ^ Greenspan 2005, pp. 218-220. ^ Kemmer & Schlapp 1971, pp. 23–24. ^ 70.0 70.1 Greenspan 2005, p. 299. ^ Stadtfriedhof, Göttingen, Germany. Librairie Immateriel. [10 March 2013]. ^ Kemmer, N.; Schlapp, R. Max Born 1882-1970. Biographical Memoirs of Fellows of the Royal Society. 1971, 17: 17–52. doi:10.1098/rsbm.1971.0002. ^ Greenspan 2005, p. 257. ^ The Born medal and prize. Institute of Physics. [2011-08-30]. ^ Max-Born-Preis [Max Born Prize]. German Physical Society. [2011-08-30]. ^ Max-Born-Institute for Nonlinear Optics and Short Pulse Spectroskopy - Developement [sic] of the MBI. [2009-03-10]. ^ 84.0 84.1 Greenspan, 2005, p. 352. ^ 97.0 97.1 Greenspan, 2005, p. 201. Bernstein, Jeremy. Max Born and the Quantum Theory. American Journal of Physics. 2005, 73 (11): 999–1008. Bibcode:2005AmJPh..73..999B. doi:10.1119/1.2060717. Born, M.; Heisenberg, W.; Jordan, P. Zur Quantenmechanik II. Zeitschrift für Physik. 1925, 35 (557–615). Bibcode:1926ZPhy...35..557B. doi:10.1007/BF01379806. Born, M.; Jordan, P. Zur Quantenmechanik (PDF). Zeitschrift für Physik. 1925, 34: 858–888. Bibcode:1925ZPhy...34..858B. doi:10.1007/BF01328531. （原始内容 (PDF)存档于2013-10-04）. Born, M. Zur Quantenmechanik der Stoßvorgänge. Zeitschrift für Physik. 1926, 37 (12): 863–867 [16 December 2008]. Bibcode:1926ZPhy...37..863B. doi:10.1007/BF01397477. Born, Max. Physics in my Generation. New York: Springer-Verlag. 1969. OCLC 53116. Born, M.; Born, M. E. H. & Einstein, A. The Born–Einstein Letters: Correspondence between Albert Einstein and Max and Hedwig Born from 1916 to 1955, with commentaries by Max Born. I. Born, trans. London, UK: Macmillan. 1971. ISBN 978-0-8027-0326-2. Born, G. V. R. The Wide-Ranging Family History of Max Born. Notes and Records of the Royal Society of London. May 2002, 56 (2): 219–262. JSTOR 3557669. doi:10.1098/rsnr.2002.0180. Greenspan, Nancy Thorndike. The End of the Certain World: The Life and Science of Max Born. New York: Basic Books. 2005. ISBN 0-7382-0693-8. OCLC 56534998. Also published in Germany: Max Born – Baumeister der Quantenwelt. Eine Biographie Spektrum Akademischer Verlag, 2005, ISBN 3-8274-1640-X. Heisenberg, W. Über quantentheoretische Umdeutung kinematischer und mechanischer Beziehungen. Zeitschrift für Physik. 1925, 33: 879–893. Bibcode:1925ZPhy...33..879H. doi:10.1007/BF01328377. Jammer, Max. The Conceptual Development of Quantum Mechanics. New York: McGraw–Hill. 1966. OCLC 534562. Jungnickel, Christa; McCormmach, Russell. Intellectual Mastery of Nature. Theoretical Physics from Ohm to Einstein, Volume 2: The Now Mighty Theoretical Physics, 1870 to 1925. Chicago: University of Chicago Press. 1986. ISBN 0-226-41585-6. OCLC 489992471. Kemmer, N.; Schlapp, R. Max Born 1882-1970. Biographical Memoirs of Fellows of the Royal Society. 1971, 17: 17–52. doi:10.1098/rsbm.1971.0002. Pais, Abraham. Niels Bohr's Times, In Physics, Philosophy and Polity. Oxford: Clarendon Press. 1991. ISBN 978-0-19-852049-8. Segrè, Emilio. From X-Rays to Quarks: Modern Physicists and their Discoveries. San Francisco: W. H. Freeman and Company. 1980. ISBN 0-7167-1147-8. OCLC 5946636. Video - Max Born (1959) : Optical Problems (German presentation). Lindau Nobel Laureate Meetings. [19 December 2014].